Some ghosts come from geographical regions and others come from specific cultures. The Dybbuk comes from Jewish folklore, but describes a type of ghost found the world over. The term Dybbuk is Hebrew and means “attachment”, and these ghosts possess the living, taking control of their actions. 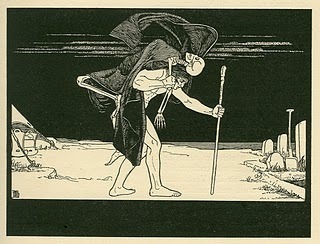 The Dybbuk itself is a spirit of the dead, usually one with unfinished business in the world of the living. Unlike most ghosts, Dybbuk are not always malicious. In fact, a Dybbuk can be quite beneficial if its own needs are met. A Dybbuk might inhabit a person to solve its own murder, and in the process bring fame and fortune to its host. Alternatively, a Dybbuk may inhabit someone with a terminal disease only to leave them somewhat healed. While it’s possible for the Dybbuk to be benign, usually they are quite malevolent. They are often the souls of those who died by violence, and may wish nothing more than revenge. In some cases, the Dybbuk might endanger the host or even lead them to their death in trying to complete its worldly business. Regardless of the spirit’s intent, once its reason for possessing a person is complete, the spirit will leave its host and move on into the afterlife. Because the Dybbuk is highly oriented on completing a goal while possessing a human being, its victim can often be helped by assisting the Dybbuk in its mission, thus ensuring the passing of the spirit more quickly. Exorcising the ghost is particularly difficult because the Dybbuk is a transitory spirit, bound to the mortal plane only by its unfinished business. A Dybbuk, therefore, has no home to be sent to, no other compulsion to follow. The Dybbuk has been featured in a number of stories and movies, most recently in the 2009 film The Unbornand the 2009 Coen brothers film A Serious Man. The idea of a possessing entity that wants to take care of something left undone in life is a very common motif in ghost stories, and thus a great many tales could be said to feature a Dybbuk. The 1990 movie Ghost featuring Patrick Swayze as a spirit that possesses Whoopi Goldberg’s character could even be interpreted as a story about a Dybbuk. Hello, my name is Veronica. I go to a secondary school and I get in one of my school subjects task to write an article on czech Wikipedia. This article impressed me, so I decided to translate it to a czech language and paste it on czech Wikipedia. But I need your agreement. So… Can I translate it and paste it to czech Wikipedia? Can I make a contract with a dybbuk?